By R. Turner Ltd. Stores reference 293/KC/42. Folding board approximately 38 x 38cm constructed from linen covered wood. 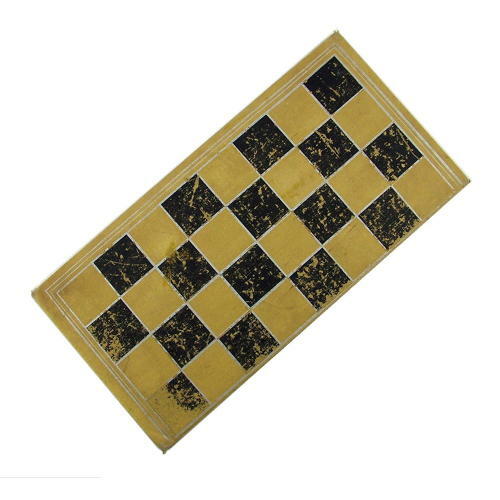 One side is coloured for use as a chess/draughts board, the reverse for backgammon. Gold blocked with manufacturer's details, Air Ministry King's crown, reference code and 1941 date. Shows use and wear - mostly to the outer side (chess/draughts), the inner being protected when not in use. A very unsual find. Picture this on a RAF station being played with as the pilots await a scramble or 'Op'. The only example we've ever seen. Please note that the playing pieces shown in some of the photographs are not included in the sale. Stock code M20456.